The emerging warmth and green of spring days tempt us. Long days at the office interrupted by relatively brief spates of outdoor time urge us to spend weekends actively exploring. 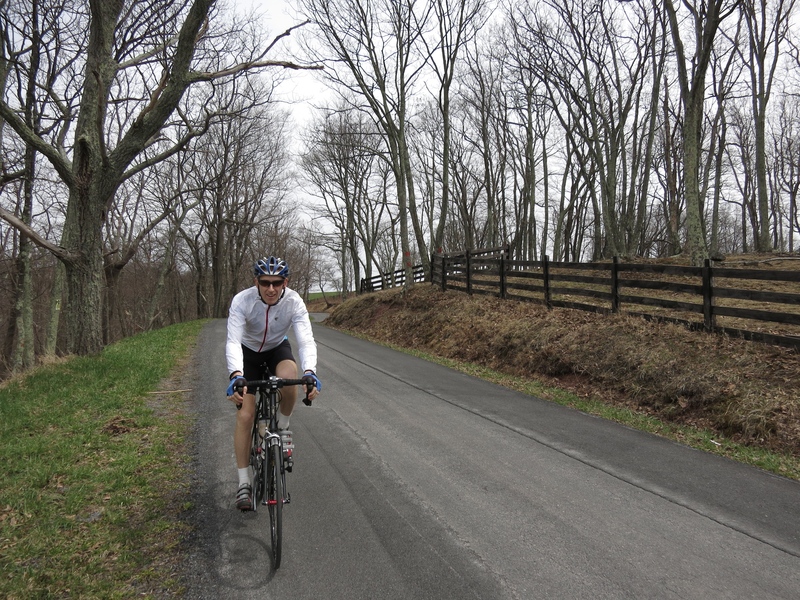 This weekend Felkerino and I joined bicycling friends Andrea and Jerry to revisit the Devil’s Daughter 210K permanent, a ride carefully crafted by RUSA permanista Crista Borras. I don’t know that I would want to attempt a course akin to the Devil’s Daughter every weekend, but it suited my mood and ambitions Saturday. Cruising sections constituted about 40 miles, with the remainder of the ride rife with intense climbs, some longer than others, and lots of chop. While the ride starts and ends in Middletown, Virginia, the bulk of the course covers territory in West Virginia. 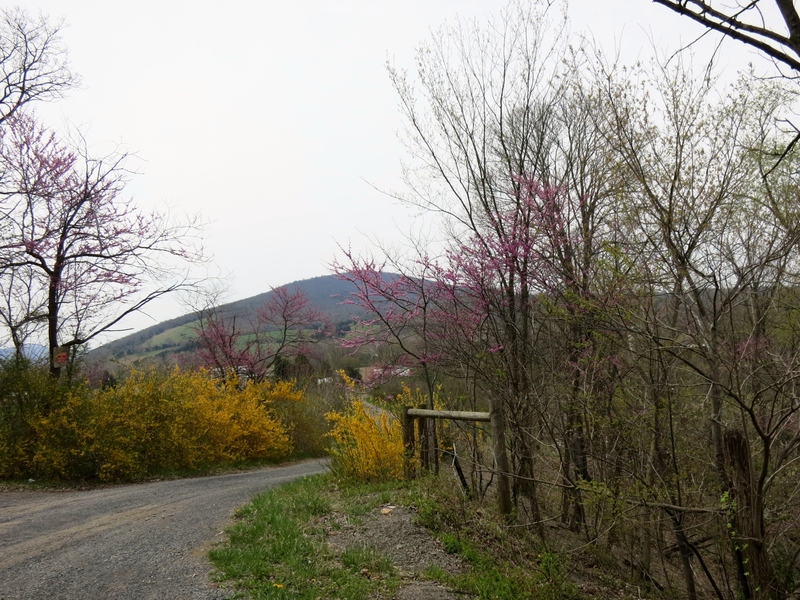 West Virginia is a spectacular place to spend the day, especially when weather is good and the forsythia and redbud are peeping out. It’s also a place where the road can be rather merciless. You wonder how the road you traverse is even paved. You wonder when it will let up. It doesn’t let up. You wonder how that’s possible. Despite the unrelenting up, you still want to take a picture to try and remember it all. Felkerino and I spent the day in excellent company. Jerry and Andrea are such experienced and confident riders that they rode their own ride even as we all stayed within eyesight of each other throughout the day. Andrea pedaled confidently away on the uphills while Jerry often would swoop by us on switchback descents. How are they doing that? Felkerino and I smoothly managed every grade that took us up higher and higher and never relented on the pedals. I was so proud of us and our “Big Cat” tandem, which is really proving itself to be an excellent climber. Perhaps another reason I enjoyed Saturday’s ride so much is because a ride with that kind of climbing obliges you to completely immerse yourself into it. Every up and down it throws at you requires focus. Distractions and worries of the day-to-day have no place. Sometimes it’s good to go on a ride and mull life over. Other days, it’s an excellent reprieve to focus on nothing other than what’s coming your way. A delightful day in the mountains. Thank you, West Virginia. See you soon. More photos where those came from. My full set here, and Andrea’s photos here. Is that you in the pic with the clip on aerobars? I’m asking because I recently got a new bike. On this bike so far and the one it replaced, despite merciless attempts at professional fitting, I get numb hands. I used clip ons on my last bike (it was a carbon racer), but this one is a Salsa Vaya. I am terrified that I will not want to be seen in public with clip ons on a vaya. 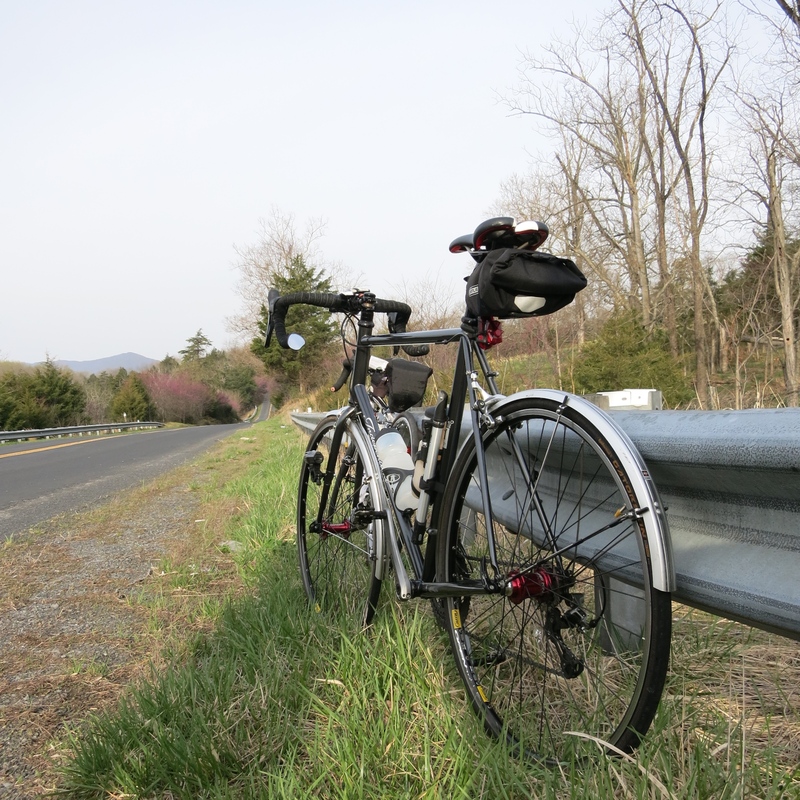 The Vaya is a much more suitable ride for me, and the numbness is less, but ever present. I’m just wanting to get a feel for how reasonable others think it may be, especially since I have been fit by several professionals to no avail. What say you? Hmm… The photo is not of me, but I’ll ask my friend and see what she thinks. Are you telling your bike fit pros that you’re racing? Then I’m guessing that they are setting you up to be VERY aerodynamic and there is more weight on your hands. You’ve already figured out that you need to remove that strain. One possible solution –Raise your handle bars. But I’m not a pro. So insert disclaimer here. I’ve only been using the aerobars for two years and it’s set up for Randonneuring. Because I do endurance cycling, it also means that I don’t care what other people think. Comfort is key when doing 100+ mile rides in one day. Keep asking questions and figure out what is right for you and your riding style. Best of luck! Great route! I wonder, though: does it really take the “new” WV55 (i.e. the “Harry Byrd Pork-Barrel Elevated Highway”) or the preferred (to me, at least) “old” 55? Given the choice, the old road has far less traffic and is very, very scenic. Otherwise, it looks like a treat of a route – one I’ll try once the ‘ol leg is back to 100 percent and my fitness is also suitably recovered. Yes, it does take the “new” way; I have not taken the Old 55 from Wardensville to Moorefield, although looking over the area, it definitely seemed as though it would be quite scenic (and lovely, too). Not sure what the mileage difference would be between the two roads. You would totally love this route, Rudi. It adds approximately 4 miles and 900 feet of climbing to the route to take Old 55. I think if I were to ride this permanent, I’d stick to the old route – it’s lovely! Excellent! Yes, I like that store. I don’t know why Lost River Grill is the control point instead (although I think they are good as well)… maybe hours of operation?